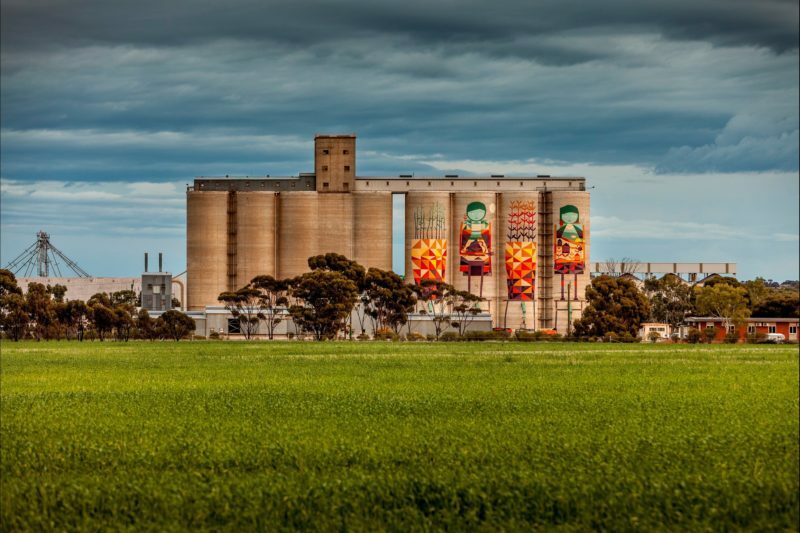 The third completed PUBLIC Silo Trail mural in regional Western Australia is a 35 metre high artwork created in August 2017 by Perth artist, Kyle Hughes-Odgers’ in Western Australia’s central Wheatbelt town of Merredin. 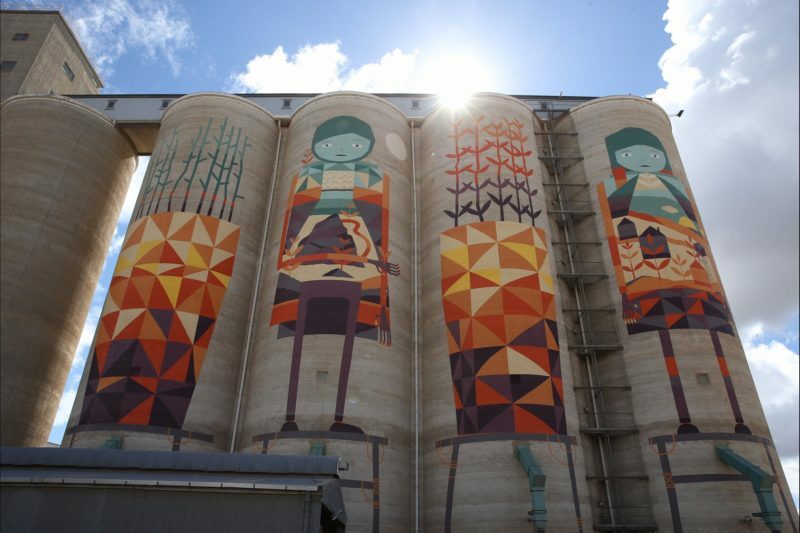 The mural joins silo artworks in Northam and Ravensthorpe which together form a self-drive trail for tourists and travelers to take through regional Western Australia casting a spotlight on less known towns. Creating the artwork was a labour of love, requiring the artist to work around the clock. 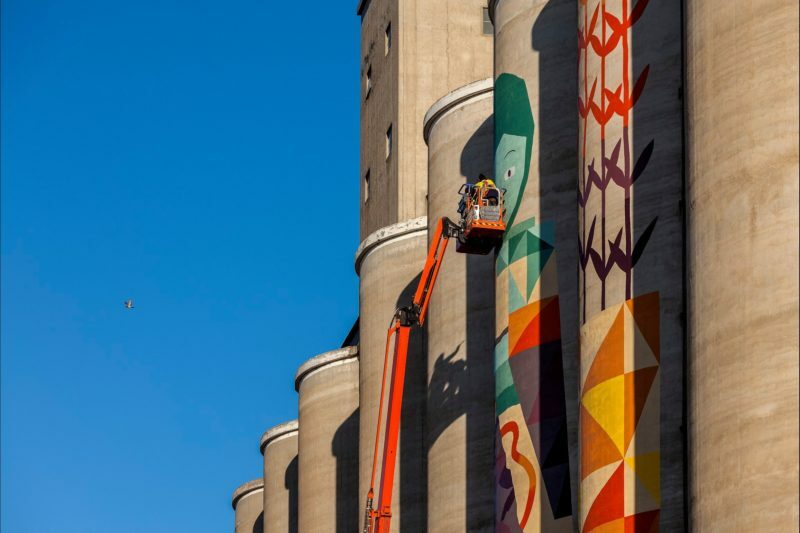 Through his geometric yet playful paintings on the Merredin silos, Hughes-Odgers depicts two large plant pots with sprouting seedlings which represent the importance of the agricultural industry to Merredin and the Wheatbelt region. A man and a woman are standing tall on the silos. 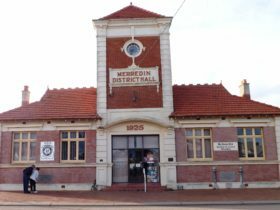 The patterns on the woman’s body pay reference to local buildings, structures and local icons in Merredin. 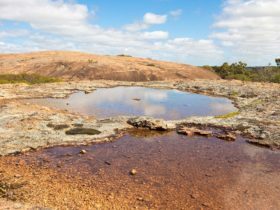 The designs on the man’s body are inspired by local salt lakes, dams, and granite outcrops. 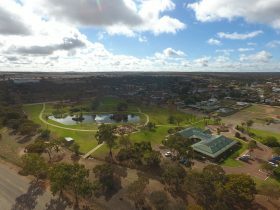 The colours are recognisable, as they are taken directly from the Wheatbelt’s natural environment. 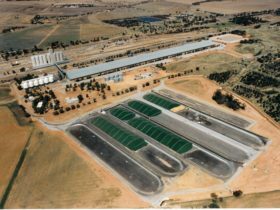 The burnt oranges, yellows, and blues are from the landscape and sky.